The answer to this question is this: Stop trying to keep them and control them with old, worn out “pay your dues” tactics, and start designing your company to be attractive to this generation, which includes over 72 million young potential employers.When it comes to loyalty, the companies Gen Y works for are last on their list. 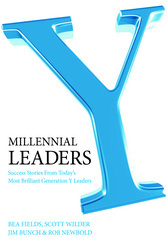 These millennial leaders are ambitious, worldly and demanding, and if you can’t give them a compelling reason to stick around, don’t expect them to. They will either find a better job in greener pastures, or they’ll move back in with mom and dad (hey…free rent and a packed fridge is not a bad deal after all, and moms and dads are allowing their 20-something age kids to move back home in droves). Many employers are labeling Gen Y workers “demanding” and “self-serving” (not a good move), and when you look at the fact that over 64 million workers will exit from the workforce by the year 2010, this puts employers in a talent deficit dilemma. The poosl they have to dip from are these young, so-called “demanding” young men and women from ages 22-30. So, if you want to attract the up and coming knowledge worker, you have to stop calling them names and start doing what you can to accommodate their needs, even if their expectations seem to be outrageous. The remainder of this article will share with you some information about the companies who I believe are doing a great job in attracting Gen Y into their workforce and a few of the strategies they are using. As you read this article, do your best to resist the thought of “Well, Google, Intuit or Deloitte would never be my competition…we are worlds apart in location, size, budget and industry focus”. While it is true that we are all not like Google or Apple, there is one thing that is true: We are in the age of the “young knowledge worker”, and Generation Y is the most high-performing generation in the history of mankind with more information in their heads and at their fingertips (and they can multi-task), so they can perform a variety of tasks in many business domains and can live anywhere if the job and company cool. So, in today’s world, any company is your competition, yet the big question is”Will Gen Y be working for you or for your competition?” Here’s my top ten list of companies who are being successful with attracting the Gen Y worker. As you read through this list, don’t try to bite off everything on this list. Simply ask yourself “How can I shift my business or organization to include a few of these strategies to make my company more attractive to the young knowledge worker?”1) Google: Focus on Perks: Google is unfortunately (or fortunately) raising the bar for each company in the world in the war for young talent. According to a study done by the Great Place to Work Institute, Google is at the top of Gen Y’s list of companies they most want to work for. Why wouldn’t when you can gain access to perks including: *On site dental and medical facilities * Free breakfast, lunch and dinner on a daily basis at 11 gourmet restaurants *Unlimited sick leave * 27 days of paid time off after one year of employment * A global education leave program which enables employees to take a leave of absence to pursue further education for up to 5 years and $150,000 in reimbursement * Free shuttles equipped with Wi-Fi from locations around the San Francisco Bay area headquarters * Classes on a variety of subjects including estate planning, Spanish, Japanese and Mandarin. 2) Intuit: Focus on a Rotational Development Program. Gen Y was born multi-tasking, so boredom on the job can set in quickly. Intuit has addressed this by offering a cracker-jack Rotational Development Program, allowing new best bitcoin trading companies in finance, marketing and product development every 6-12 months. This program not only keeps young workers engaged but prepares them for future leadership positions in the company. 3) Walt Disney: Focus on Internships and a Collaborative Culture. Disney has a rock solid internship program for college students, which includes college credits for the colleges they partner with, which gets young leaders committed to the company before they graduate. Disney is also built on a foundation of a diverse and collaborative culture, and Generation Y was born playing on teams made up of members from all cultures and walks of life. The sense of camaraderie makes Disney attractive for Gen Y, because it breeds a familiar sense of teamwork. 4) Deloitte and Touche: Focus on Leadership Development. Generation Y is very attracted to all aspects of learning and development. They have been raised on a diet which includes a combination of personal, leadership and team development. Deloitte and Touche have therefore designed a state of the art leadership program called the Future Leaders Apprentice Program (FLAP), and new recruits are immediately eligible for the program. Deloitte is also offering a top flight coaching and mentoring program. Because Gen Y has been coached since age 5, they are saying that the coaching and development programs offered by Deloitte are two of the main attraction points that has them stick around or return later in their career. 5) The Peace Corps. Focus on Saving the World. The pay is not so great (as a matter of fact, most Gen Y leaders say it’s lousy), but they are willing to sacrifice pay in order to do meaningful work on a global scale, to work and live in another country where they can become fluent in a new language and to toughen up mentally and emotionally by doing hard work with long hours. Generation Y sees companies who are making a significant contribution back to their communities as tops on their lists for future employment. Teach for America is another hot and growing company that allows emerging leaders the opportunity to teach in failing school districts…another approach to “making a difference” in the world. 6) Lockheed Martin. Focus on Continuing Education. Gen Y is all about knowledge acquisition and this aeronautics and space company has hit the nail on the head with 20-something recruits by offering a maximum of $7500.00 annual for education reimbursement and full graduate school sponsorship for junior level employees. 7) L’Oreal USA: Focus on College Competitions and World Travel. If you have not noticed this lately, Gen Y LOVES a competition, and they are certainly keen on world travel. You only have to watch American Idol, So You Think You Can Dance or America’s Next Top Model to verify this. L”Oreal has latched onto this idea with its L’Oreal Brandstorm Competition, providing college students the opportunity to compete by putting themselves in the shoes of a L’Oreal Brand Manager. The competition allows emerging leaders the opportunity to analyze consumer trends while developing a top of the line marketing and advertising campaign for L’Oreal. The winner receives a trip to Paris and the opportunity to interact with top L’Oreal managers, giving young recruits a leg up during the recruiting and hiring process. The competition alone creates buzz and a “cool factor” for L’Oreal, which is appealing to 20-somethings. 8)Southwest Airlines: Focus on Fun. If you have never flown Southwest, I highly recommend you do it just one time…just for the fun of it. Generation Y’s mantra is “Live First, Work Second and Have Fun!”, and Southwest’s quirky but fun-loving culture makes it a great first stomping grounds for the young knowledge worker. 9) Nike: Focus on Fitness. Nike’s campus is a prime location for Gen Y, who hits the gym at least 3-4 times each week, and the ones that doesn’t are probably Working Out from home. Nike is situated on over 170 acres, which includes a fabulous exercise center with training equipment and good bikes for exercises, playing fields and running trails. And of course, their “Just Do It” tagline inspires young workers to actually use these facilities rather than sitting at home in front of their computer or the tube. 10) Apple: Focus on Simplicity. If you have visited an Apple store lately, you will notice that you will be greeted by a young man or woman under age 30 at the Genius Bar. Apple is filled with Gen Y employees. The reason? Apple makes things simple. In a report by Outlaw Consulting, Apple won the number 1 loyalty spot for Gen Y, because their products are as “stripped-down and unadorned as possible” (According to Outlaw Consulting). To be simple means convenience and speed to the multi-tasking Gen Y crowd. This audience is also highly dedicated to saving the environment, the concept of excess means that the environment may be harmed even more. Gen Y is therefore choosing to work for companies like Apple whose positioning is dedicated to the greening of our world..